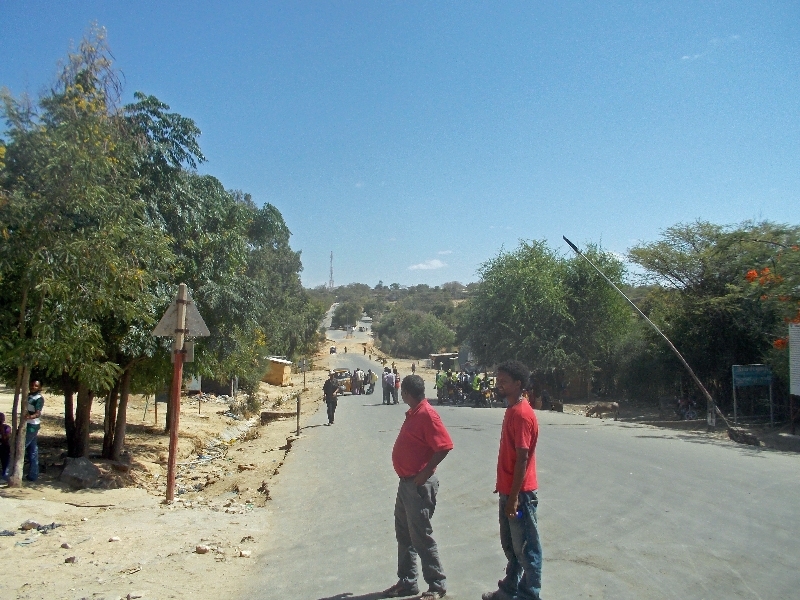 Today was an easy cycling day to Moyale, a border crossing to Kenya and updated information about the days ahead. The road was smooth and not much in the way of hills. After having breakfast it was thus a pretty quick ride to lunch at 50km. We passed through a few small villages and locals were out watching as we cycled past. Some children were having fun chanting in unison at riders to see what response they might get. Women here are more likely to be dressed in tribal colors. 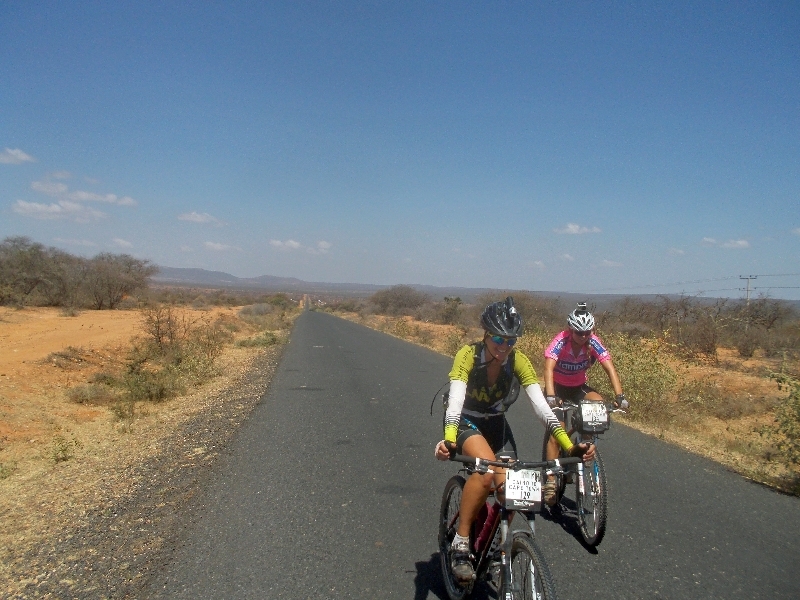 Those hills weren’t too steep, at photo below, Tessa and Claire were crossing almost last hill into Moyale. There was no race and hence it was an easy ride. What we didn’t realize was that the Ethiopian immigration office would take a two hour lunch stop from noon to 2pm. I arrived just a little past noon and hence like half the other riders, could see Kenya below but needed to wait at local cafe before we could check out of Ethiopia. Money changers came past to get rid of remaining birr, at least those not spent on coke or a snack. As 2pm came we crossed out. Both Kenya and Ethiopia had new biometric scanners that took our finger prints. 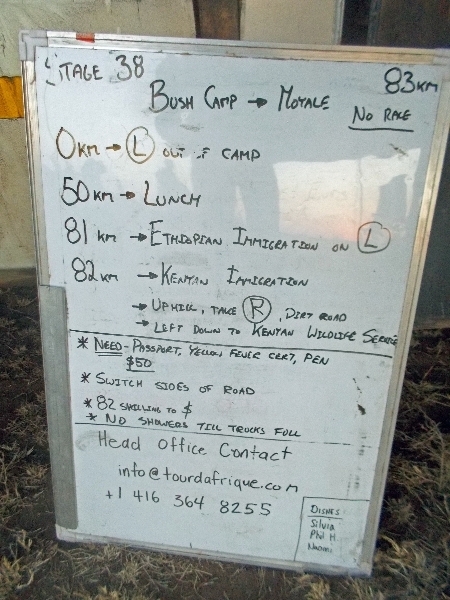 We filled out the appropriate forms and without much difficulty checked out of Ethiopia, crossed to Kenya and were into the fourth country of the trip. I bought a local SIM card, but vendor failed to tell me about the registration step (or do it for me as others had done) and hence my phone didn’t work yet. By time I figured it out, the vendor had closed. We also learned of a revision of plans ahead. We are advised not to travel on election day and also that we’ll be in better position out of the northern areas in unlikely possibility of any election unrest. Hence, we replace five cycling days with two days of bus travel. We’ll then watch election results and few days after before proceeding on the road again. Mike – great blog ! thanks for the great updates, especially mileages and road conditions. Thanks also for the photo of Tessa and Claire. i had been following Tessa’s blog too, which had been inactive since feb 14 – i was hoping she hadn’t dropped out. Tessa just updated her blog again today. Thanks. There are some 62 year olds on this trip that put me to shame. Most individual days aren’t as difficult sometimes as the accumulation, but still very much recommend this ride.